Everyday Fashion and Finance: Spring Forward! Usually the weekend that we "spring forward" is a big bummer - we lose an hour of sleep and for some reason it affects us for days. This year, though, I didn't hate it. Sunday was so beautiful that I forgot that I lost an hour (until Monday morning, that is). It was sunny and a high of 65. It felt like spring. I was more than happy to break out my chambray shirt dress for the occasion. I didn't even need a coat. Since we had our home inspection on the lake house the day before, we thought it would be fun to go to Home Goods and check out some potential decor for the house! With the money we will be spending on renovations, I will have a limited budget for decorating, so there will be a lot of Home Goods, Target (loving the Threshold line), Etsy and thrift store shopping in my near future - which I love! Luckily, we basically have all the furniture and kitchen items we need, so we don't need to worry about that. I also had to run some errands for my Ireland and Scotland trip with Stacey (I cannot believe we are leaving on WEDNESDAY! So excited!) And of course, I hit up The Limited to take advantage of the buy one, get one free blazers, pants and skirts promo that they have going on. I bought four pairs of much needed pants for work and two blazers in a red/coral color and mint (obsessed). I must say, I am pretty proud of my spring purchases. I have managed to get great deals and buy items that can be mixed and matched in a variety of different ways. Sunday's weather was a sign that I will soon be able to wear all of these new things! Although I was excited to wear my chambray shirt dress, I was the most excited about finally getting to wear my Tory Burch Shelby Ballet flats! Justin bought me these for Christmas, and I am in love with them! He picked them out himself, and I was so impressed with how well he knew my style. I shouldn't have been surprised though - Justin has always been good at knowing what I like. I cannot believe I was able to wait until March to wear these shoes, but I did not want to wear them in the snow at all. Sunday was the first day where I felt it was nice enough to wear them - still love them! 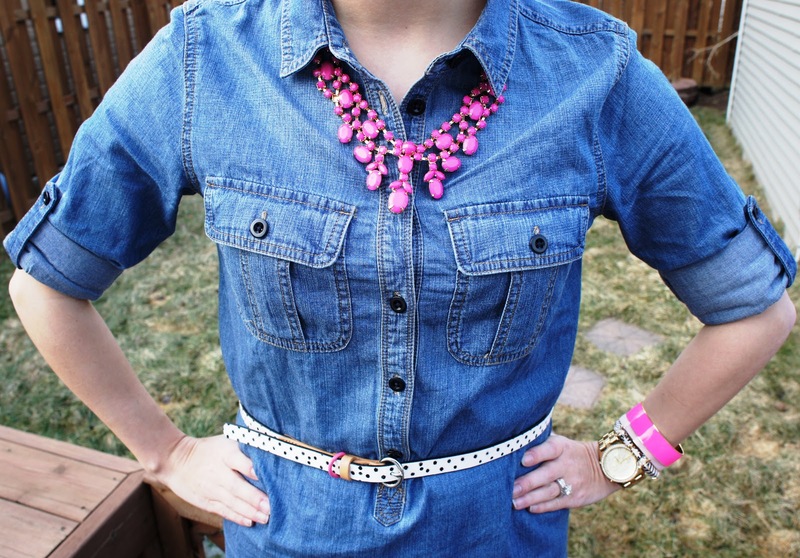 I accessorized my chambray shirt dress with pops of pink and a polka belt that I recently got for 40% off at Loft. How cute is that Forever 21 necklace? Yes, Forever 21! I am loving their super affordable jewelry options right now! I also threw in my Target zebra bangle for some fun (please don't mind my naked nails). There are numerous ways you can style the chambray shirt dress, though. It basically goes with everything. It is a staple item in my spring and summer wardrobe. 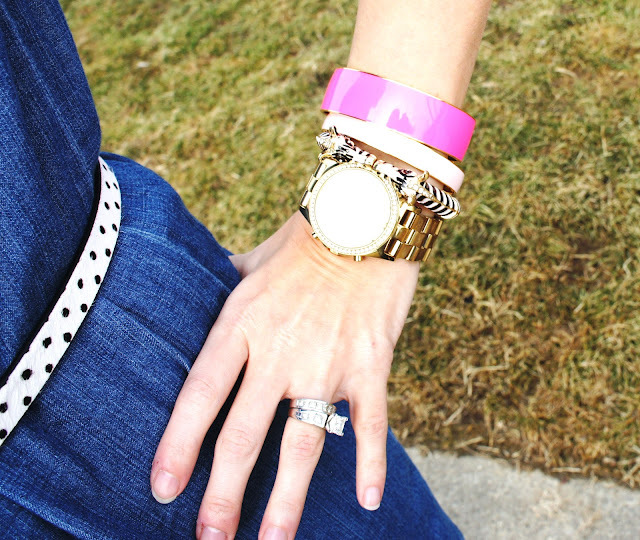 Switch the belt and the jewelry (or add a scarf), and you have a whole new look - totally worth it! It also makes for a great bathing suit cover up (I clearly have lake house on the brain). Of course, after such a gorgeous Sunday, it is going to get cold again this week. I remain optimistic though! When I get back from my trip with Stacey, it WILL be spring. It. Will. Be. If you will it, it will come - right? Speaking of my trip, the packing is ongoing, but I think I am in pretty good shape. I am far ahead of my typical packing schedule. I am usually that last minute, stressed out person who then completely overpacks. This time I feel somewhat prepared. Most of my things are already in my suitcase, and I don't think I will overpack - shocker! Who AM I?! I am sure there will be a little stress tomorrow night and Wednesday morning, regardless, but none of that will matter once I get on that plane. If I need anything, I can always buy it over there. I am going to Ireland and Scotland with my best friend. And that is all that matters. How are you adjusting to "spring forward?" What are you most looking forward to wearing once spring is officially here? Cute outfit! The weather has been perfect here too... I am looking forward to wearing all of my new Spring clothes!! P.S. I don't know if you have been able to check out my blog, but I nominated you for the Liebster blog award. Follow the link here for details! You look so cute! I got this dress too. Love it! Sand the hubs definitely has good taste. Hey Elvy! Thanks so much! The dress is definitely a staple item! I will be wearing it a lot this spring! Thanks, Kelly!! I think I got too excited about the weather, because it snowed last night. Luckily, it's just a dusting, but it's cold again - boo :( So. over. snow. 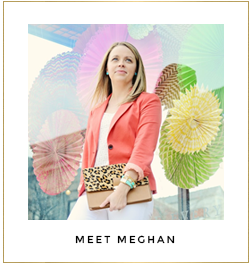 Follow me back, I just started a mom style, organization, craft blog. Hi Sammie! Thanks for stopping by! I am hopping over to your blog now! I def. need to add a chambray dress to my closet! Yes, you do! It's a staple! I love that you did a Gigglosophy giveaway! My spike bracelet is from her too, and I love it! One of my fave Etsy shops! Cute shirt dress! You styled it really well. =) Your necklace is really epic. =) You're so gorgeous!! Thanks so much, Callie! You are too sweet! very cute!! Love the flats and the pop of pink. A well made evening dress should always fit any body type nicely and make any woman feel beautiful..